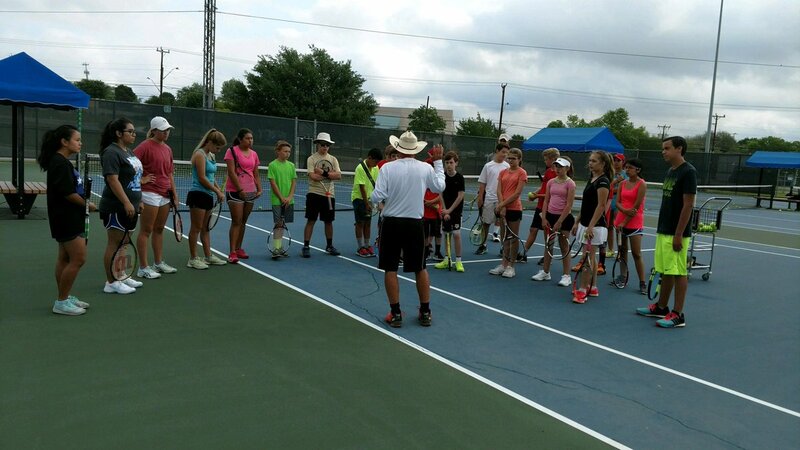 The Seguin Summer Tennis Club is designed for Seguin area elementary, middle and high schoolers. The program is under the direction of Coach Sam Chadwell, who is a certified USPTA Professional and has been involved in the tennis industry as a player, coach, and community organizer for 30 years. Sam’s passion is to get young people started off on a solid foundation of fundamentals and guide them through the learning process to become an established player. Program meets Tuesdays at Seguin High School starting June 12. You may pay with cash or check at the first class meeting. Early Registration Incentive: Sign up and pay by May 24 and receive special pricing on future lessons, play days and tournaments. I hereby give my approval for my child’s participation in any and all activities prepared by Coach Sam Chadwell and Seguin ISD during the selected camp. In exchange for the acceptance of said child’s candidacy by Coach Sam Chadwell, I assume all risk and hazards incidental to the conduct of the activities, and release, absolve and hold harmless Coach Sam Chadwell, Seguin ISD, and all its respective officers, agents, and representatives from any and all liability for injuries to said child arising out of traveling to, participating in, or returning from selected camp sessions. In case of injury to said child, I hereby waive all claims against SEGUIN ISD. including all coaches and affiliates, all participants, sponsoring agencies, advertisers, and, if applicable, owners and lessors of premises used to conduct the event. There is a risk of being injured that is inherent in all sports activities, including basketball. Some of these injuries include, but are not limited to, the risk of fractures, paralysis, or death. Permission is also granted to Seguin ISD. and its affiliates including Directors, Coaches, and Team Parents to provide the needed emergency treatment prior to the child’s admission to the medical facility.